Walking along Colaba Causeway, foreigners are in high demand, and for a change, they want to give us money. The Bollywood film industry in Mumbai is booming, with half a dozen features being filmed around the city on any given day. White faces are sought out for background work, and it is considered de rigueur on the backpacker circuit to work as an extra. As it was a starred item on our cliched-but-still-valuable experiences of India checklist, we were excited to be cast by a background talent agent within our first hour in Mumbai. Extras were needed for a fancy restaurant scene (set in Bangkok) for the movie Blue, which stars Katrina Kaif, a young up-and-comer, and Akshay Kumer, a "big-time superstar". Andrew, who had already familiarized himself with the top Indian film stars by reading two Bollywood gossip mags on the train, was impressed with the star power, and so we accepted the offer. Unfortunately, our Bollywood experience was far from glamorous. Thirty of us were packed into a non-AC bus in the middle of Bombay rush-hour. Two hours later, we arrived in the service entrance of the Renaissance Hotel and we "hurried up and waited", as they say, to be handed out tacky outfits with far too much lace and polyester. The girls then lined up for makeup and hair, with disastrous results. 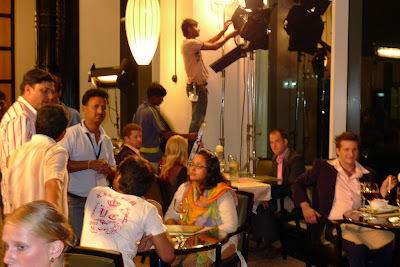 Six hours after our bus departed downtown Bombay, the restless extras were hoarded through the hotel and onto our set. 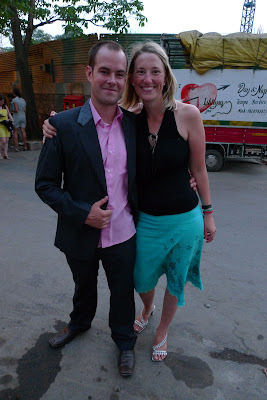 The mise-en-scene was tasteful and quite high-budget (unfortunately, the same can't be said about our outfits). The producers picked through the women extras and chose their favourites. Those with long blonde hair were positioned in the centre of the shot, and those of us with shorter and/or darker hair were placed around the peripheries. While I sulked behind a pillar in the back left, Andrew was centre-stage, playing the doting boyfriend of a young girl from England with Barbie-doll features. Ouch. The frenetic energy on set died down after a couple of hours, as the two stars still hadn't shown. Rumours began to circulate: Katrina was filming another movie, and was caught on set across the city. Gasp! Eventually, a man came running into the room and made the universal sign of a hand cutting his throat: Shoot's over! The disgruntled extras started collecting our things, but then a vision in red appeared. It was Katrina Kaif, walking with purpose onto set... Four hours late, but she is gorgeous, and immediately forgiven. But, thirty minutes later (now 11:30pm), the male star had not yet appeared, and this time the shoot was cancelled for good. And so, we headed back downtown tired, cranky, and some of us with a bruised ego. The next day, it was front page news: AKSHAY KUMAR EMBARRASSES INDIA. While modeling in an Indian Fashion Week show earlier in the day of our shoot for the Levi's "Un-zipped" campaign, Akshay had his wife unzip his jeans. Apparently, some members of the audience were outraged and marched straight to the police office. An official police complaint has been issued against Kumar for public indecency. He was last seen on a flight with his wife to South Africa. fugly no....mel. you're slightly grade 8 dance style and andrew is a tad euro trash, but the clothes seem to fit well....so does this mean we won't see you in "akshay unzipped"? So many things to say. But I ll just say that I love you guys, and I ve been blessed by rats at the temple. And I saw a white one, which is very rare and means good luck. fantastic story. absolutely loved it. how much moula did you get paid cdn - just curious? 500 rupees, or $12.50. which doesn't sound that impressive, but it's half our day's budget.